Chianti Classico is a dry, red wine made only in a specific part of Tuscany in central Italy. Here’s how to make sure you’re getting the real deal. Specifically in central Tuscany, in the mountain-air-cooled hills between Siena and Florence by the Monti Chianti. Medieval Chianti was mostly host to ongoing battles between the two cities, but written mentions of wine from Chianti appear on manuscripts and historical documents from the 1200s. Then, protected by the 14th-century military league Lega di Chianti, these hills became dedicated to growing local grapes like Sangiovese and Canaiolo Nero. A 1398 legal document uses the name “Chianti” to refer to the red wine typical of this area. In 1716 it became one of the world’s earliest legally defined wine-making zones, when Tuscan grand duke Cosimo III declared the land centered on the townships of Gaiole, Radda, Castellina, and Greve the official production area of any wines bearing the Chianti name. As of 1984, the modern-day equivalent, the legal wine appellation Chianti Classico DOCG, defines those same boundaries as the only place this particular wine can be made. Throughout the area, vineyards rise from 200 meters above sea level to around 600, with occasional steep slopes, planted in a variety of soil types covered by shallow stony earth and crossed by a series of creeks, rivers, and streams. Add the summertime hot days and cool nights and cold winters here for Chianti Classico wine’s calling card of light-bodied structure and concentrated wild strawberry, floral, and woodsy aromas. For centuries, the wine of the Chianti Classico area was a blend of grapes grown only in the area: varying percentages of reds like Canaiolo Nero, Colorino, and Sangiovese and whites like Trebbiano and Malvasia. Then in the mid-1800s, the Baron Bettino Ricasoli, of the noble family that had lived in these hills for more than a thousand years, studied the soils, experimented with blends, and decided Sangiovese represented the land of Chianti the most faithfully. He proposed that the grape should have the leading role in Chianti’s wines, prominent contemporary wine critics agreed, and modern Chianti was born under the Ricasoli label — today the winery uses the same Sangiovese clones their founder did. The Baron’s “formula” is also the basis of the DOCG: all Chianti Classico wines are at least 80% Sangiovese. Some are blended with native grapes like Canaiolo Nero and Colorino, others with grapes known around the world like Cabernet Sauvignon or Merlot; still other Chianti Classico bottles are filled with 100% Sangiovese. A hungry black rooster. Legend has it that one of the many Chianti land disputes between Siena and Florence would be decided by an early-morning horse race from their respective cities: where the two riders met, the new border would be drawn. Each city picked a rooster that would have their rider set off first, to cover and claim more territory: Siena is said to have chosen a well-fed white one in hopes of a more robust crowing, while soon-to-be-victorious Florence relied on its grouchy earlier-rising unfed counterpart. What is known is that the 14th-century Lega di Chianti that protected Chianti’s main towns of Gaiole, Radda, and Castellina against Siena attacks, held the gallo nero, black rooster, as a symbol of vigilance and its official emblem. The Chianti hills became known as the land of the Gallo Nero, and in 1932 the area’s first wine consortium — formed to regulate, protect, and promote Chianti’s classic wines — was quickly nicknamed the Consorzio del Gallo Nero. The black rooster has served as Chianti Classico’s official wine bottle marker since 2005. According to DOCG rules, Chianti Classico is legally defined by its aromas of wild berries, violet, iris, earthiness, and spices; as a savory wine with noticeable tannins; and a fair amount of acidity. When those traits are guaranteed in every bottle, then the wine is labeled with a black rooster. Long united by history, geography, and style, Chianti Classico is now being recognized for its differences, too, with, for example, the township of Gaiole exalted for its vineyards planted in a mix of soils that can vary meter by meter, ranging from the region’s famous schist-y galestro to the compact mix of clay and limestone called alberese, and rising from 150 to 650 meters above sea level for an especially complex wine when blended together or a fascinating array of Sangiovese expressions in single-vineyard bottlings. 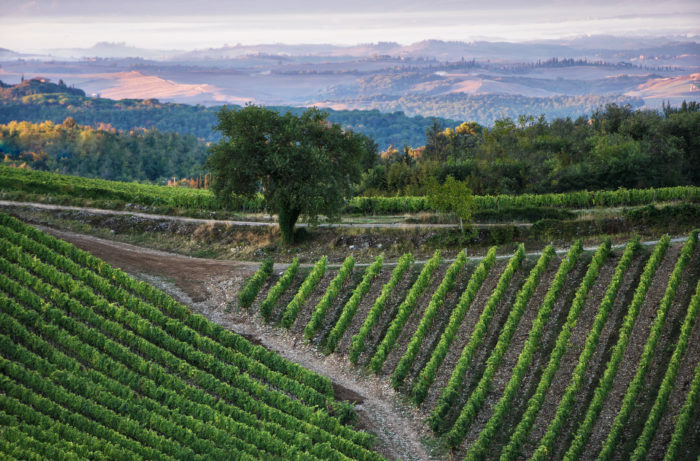 In Radda, two thirds of the land is covered by forest and tree-surrounded vineyards planted in limestone produce long-lasting wines that soften with age. In Castellina, where vineyards are planted at up to 600 meters, from the north come fresh, minerally mountain wines, while the clay-based south offers wines with fruitier aromas. Chianti Classico is always light in color, a subdued red with a hint of brown. While other wines can be described as powerful, still others as delicate, Chianti Classico is best described as a balance of elegant and rustic, with juicy, straightforward tannins, and alcohol starting at just 12% make for a lighter-bodied wine — and a refreshing accompaniment to food. Chianti Classico is especially ideal for two countryside-inspired Tuscan delicacies based on tomatoes and the concentrated flavors of day-old bread. The wine’s steady structure of acidity and tannins, and its savory intensity, are a special match for both Pappa al pomodoro and Panzanella. The former is a nourishing wintertime soup of pureed pomodori (tomatoes), fortified by slow-cooking with toasted stale-bread slices, broth, olive oil, garlic, and basil. The latter features those same ingredients (tomatoes chopped instead, trade in the garlic for red onion, add cucumber and white-wine vinegar) tossed in a cooling, sustaining summertime salad.